Dimensions: 11.75" Dia. 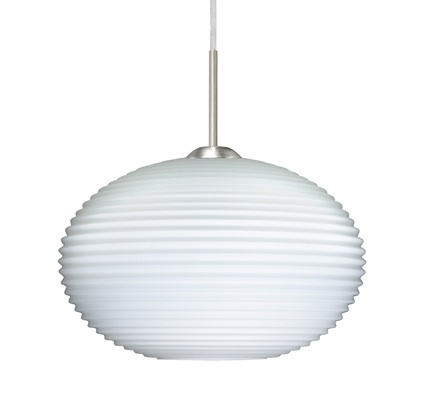 x 7.5"H.
The Pape Pendant has a unique handmade ribbed glass diffuser in a opal matte finish. This beautiful pendant will add a wonderful style to your space. Standard lamping is 100W incandescent bulb, suitable for dimming (dimmer not included). Bulbs not included. Cord Suspension comes with 10' cord, 5" decorative sleeve at socketholder. Stem mount comes with 4 connectable 3", 6", 12" and 18" stem lengths. Stems are plated steel. Suitable for damp locations (interior use only).